Living in New York, I'm always forced to grab a cab.. But I don't settle for just any cab. I will literally wait for hours at a time until I see Taxi #43. While there many-a-Turkish cab drivers in NYC, Azize Hasad holds a special place in my heart, as he holds one of the single best forhead strips in the tri state area. 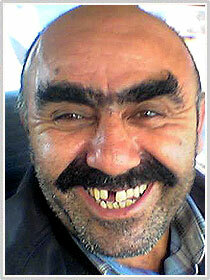 This thoughrobred monobrow specimen is not only completely enamouring, but obviously well worth the wait. Thanks Azize for making our beloved city a more spectacular place. I owe you. The mayor owes you. Even the people of New York owe you. You've no doubt spruced the local economy by bringing in your share of man-hedge gawking tourists. At Monobrow.com, we don't view having one eyebrow as a grotesque, freakish human deformity. On the contrary. We think you are special (and not the kind of special where you wear a helmet.) The kind of special where people look at the hairy, catipillar-like growth above your eyes and say, "Oh my God! What the hell is that thing?" You're not alone. Monobrow.com, celebrating the unity of your eyebrows.